Hi, I have just read your 'starting out ' and found it really really interesting and useful! It’s exactly what I was looking for. I have always dreamt of starting my own food business mainly a burger/hot dog van as i know it can be very profitable!. I am fed up with my 9 - 5 office job with low pay and want to venture out there and earn some real money. Granted its hard work and a lot of obstacles to get over before I can get started but silly as it seems it’s something I am very passionate about. There will be two of us starting the business me and my best friend. We have been looking on e bay but still some of the burger vans are quite pricey..Can you rent burger vans and still trade from them? We were also wondering if we could rent until we have saved up enough money to buy...we would be very grateful for your advice. Thank you David for your advice on researching areas for setting up a food van business, I will have to look further than my own area as it seems to be polluted with food outlets, but I’ll keep looking around. I commend you on wanting to start your own business in mobile catering and be able to be more in charge of your future. With regards to renting a mobile trailer, this is a good idea and I usually recommend this choice.This will give you the opportunity to try out the business for a set time and see if it's something you would like to pursue for the long term. 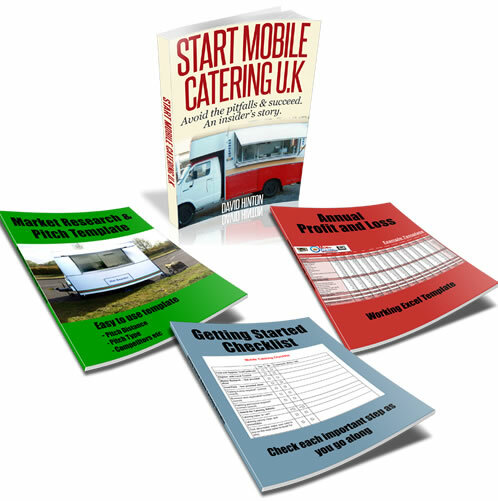 There are also quite a few companies around that rent catering trailers but prices due vary so try and get a good deal for say a 3 month period. Now, with the football matches and fairs I actually didn't have to do anything(just lucky) PEOPLE saw my catering van and asked me if I can cover the event for them.Football matches vary from £200 upward a day (local football match)Local summer fairs around the same. Hope this helps you out, also make sure that if you buy or rent your trailer it must be very clean in appearance.